D1 Champion Nobuteru Taniguchi supervision. "HIPERMAX-D' NOB SPEC" is a Suspension for Easy Drifting! 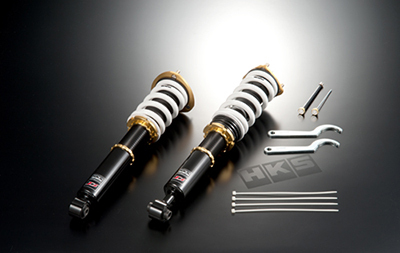 Collaboration between HKS and the first D1 champion Mr. Nobuteru Taniguchi created HIPERMAX D' NOB spec. This is the suspension for "easy drifting." Stiff suspension is not the only tool for drifting. Mr. Taniguchi and HKS conducted tests on load shift, traction, etc at various levels of drifting skill, and the best specifications for drifting were developed. 『HIPERMAX D' NOBspec.』brings back the fun of drifting. A mono-tube suspension structure was utilized for high ride quality and the fun of sporty driving. PNE Coating's corrosion resistance is 5 times as much as the galvanization. This coating can protect against rust, and its smooth surface requires less force to adjust the ride height than conventional dampers. Linear progression piston adjusts oil passages for precise stroke management, resulting in smoother valve movements. As piston speed increases, dampening rate also increases linearly. Wider setting range of a caster and camber can be provided. * 2 way pillow upper mounts are only for inverted strut type. The anti-rust and anti-corrosion for enhanced durability are featured. Using these can cut the unsprung weight. 30 levels of dampening adjustment allow fine tune adjustment for various driving situations based on tires’ types, vehicle settings, etc. The best specification to maintain load shift, traction, etc. for perfect and easy drifting.